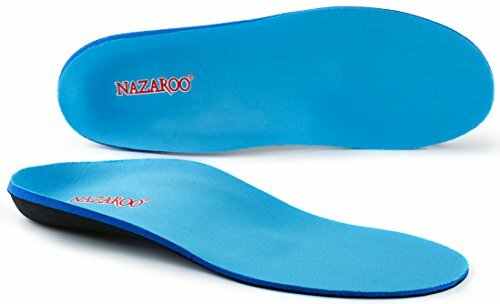 NAZAROO insoles are ideal orthotic inserts for preventing and alleviating pain associated with Flat Feet, Plantar Fasciitis, Metatarsal pain, Foot/Knee Pain, Arch/Heel Pain, Arthritis, Supination, Bunions, Morton's Neuroma, Overpronation,etc. They are often recommended by podiatrists and chiropractors for long-term support to relieve foot pain. - Deep Heel Cup keeps your foot aligned and helps support the foot during high impact activities and long distances. - Arch Support helps stabilize and support the foot to improve alignment and reduce stress on feet, ankles and knees. - Breathable, anti-sweat and anti-bacterial top layer ensures fresh and comfort by sucking up sweet and monisture produced by your feet. - Resilient, 5mm polyurethane foam top cover puts a spring in your step and adds long-lasting comfort to any shoe. - Excellent mobility allows for free and easy movement of the foot, without locking it in place. ◈ Nurses ◈ Doctors ◈ Teachers ◈ Servicemen ◈ Architect ◈ Builders ◈ Chefs, etc. Your satisfaction is our priority. If you are not satisfied with our insoles or they can't meet your expectation to relieve feet pain, we'll offer a reasonable and acceptable solution to make it up for you. You can contact us at anytime if you have any problem. ★ 100% MONEY BACK GUARANTEE: Your satisfaction is our priority. If you are not satisfied with our insoles or they can't meet your expectation to relieve feet pain, we'll refund you the full price *No Questions Asked*. You can contact us at anytime if you have any problem. If you have any questions about this product by NAZAROO, contact us by completing and submitting the form below. If you are looking for a specif part number, please include it with your message.